Just in case you want to refer to a google map. In the first installment of this photowalk- we scuttled through western Queens, which is the northern ventricle of our Newtown Pentacle- descending from the heights in Astoria into the milieu of 19th century teutonic progressivism- and then stumbled in front of a long forgotten relict of the 1920’s gilded age in the 20th. In the second, we lurked, fearfully, down 37th avenue and found an anomalous municipal building which does not exist- as well as a fortress church. Today, we enter a place of vine encumbered trees which abut vast fields of machinery, and we shall gaze upon an unforgettable sight. But first, we must cross the angles found between neighborhoods, crossing a bridge and avoiding its troll- only to stand revealed in the dappled light of the Sunnyside. A desperate precipice, whose slimy walls- comically adorned with painted signs declaring that “these walls are under video surveillance” drip with an obsidian jelly whose composition is a cocktail of fecund decay and petroleum byproduct. The prodigious twin elevated tracks of the LIRR define the eastern borders of industrial Long Island City, residential Astoria, and the vernal lanes of Sunnyside. 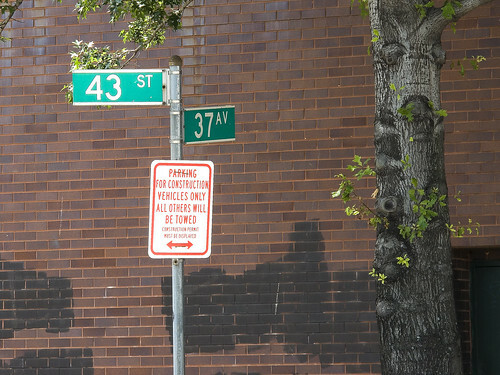 Make the left on 43rd street, and proceed into its fuligin shadows. These tracks are critical infrastructure for the forthcoming East Side Access project. To your right is a turnaround track for the one and 3/4 mile long Sunnyside Yard, and a stout fence which bars entry to the great railhead. An odd smell hangs in the air, mildewed garbage and long dead pigeons mixed with an ozone smell from the vast electrical works beyond the fenceline. Also, there is a human smell. In a few pockets, here and there, you will observe signs of an unclean and debased occupation. I will refer you to this document, found at nyc.gov, specifically to section Q80 for the development plans being discussed for the Sunnyside Yard after the East Side access project is complete. Its implications are staggering. As part of the recent migration enacted by those born south of the United State’s border with the ancient nation of Mexico, a large population of spanish speakers have emerged in the Newtown Pentacle within recent years. Whereas the vast majority of those involved in this 21st century diaspora are following in the solid familial and social traditions typified by those fabled “ethnic waves” of immigration in the 19th and 20th centuries which are the foundation of our modern city- camp followers, debased mendicants, and criminal organizations have also followed the huddled masses that have made the arduous journey to “El Norte”. Just like similar characters followed populations of workers and poets, during earlier times. Such hubris and hope is the immigrant’s song. This “dark side” of our new countrymen, which is unapologetically visible, colors the perception of area residents about the new neighbors. Hard working former peasants who have often assumed jobs of the most menial type, this population of Latinos are adopting the familiar immigrant patterns- large families living in crowded apartments, ethnic concentrations coagulating around a certain neighborhood or subway stop, a vibrant and overtly public street life, and an uphill battle with the institutional and linguistic barriers to financial security and class mobility that are familiar stories to any 2nd or 3rd generation Italian, Jew, or Boricua. “The street signs are in Spanish over there” is heard often when referring to nearby Corona, arousing the spectre of the United States’s greatest sin- social class based racism and its bloody consequence. The same could have been said about my father’s old neighborhood in Borough Park, transposing Spanish with Italian or Yiddish- or modern Astoria with usage of the Greek language. Careful observation of the baser individuals who poison the reputations of this new group, often found in an alcohol fueled stupor on one’s stoop or sidewalk, leads me to recall the Hobo culture of the 20th century (which plagued the American rail system for much of its history, until the age of containerization). Cruel and malicious, the nickname attached to these pathetic individuals (in Astoria, at least) is “Los Caballeros“. A particularly daring trio of these men made camp in the backyard of a vacationing octogenarian acquaintance recently. This distinguished woman, whose father was one of the original residential developer-builders of this area in the 1920’s, was forced to invoke the massive powers of the NYPD to evict them from her property upon returning from a long trip abroad. All over the area- broken hip flask bottles of discount liquor and half eaten meals can be observed, casually discarded on sidewalk and stoop, public sleepers are not sought- but easily found, and encounters with inebriated gatherings of debased men in the dark of night are becoming a common experience. A statement of opinion and “I grew up in NYC during the 80’s” wisdom from your humble narrator is “there is a difference between being homeless and being a BUM”. Like much of the addled and disingenuous public dialogue exchanged between the citizens of the City of Greater New York these days, the word “homeless” is part of an agenda of orwellian newspeak and sociological engineering propagated by an academic class which speaks from the safety of gleaming towers and air conditioned offices in Manhattan. (I distinctly remember when the term was first coined in the 1980’s, and it was no longer polite to call them Bums (drunks or addicts) or Tramps (nutjobs). It was decided by these professor/doctor types to distinguish between the drunken and pitiless vagrant, and the “down on her luck single mother who was sleeping on a steam grate with her two children by Grand Central” meme. These sort of images, while actual, were used to illustrate- on a national political stage- how the disastrous fiscal policy called “Reaganomics” had led America astray. 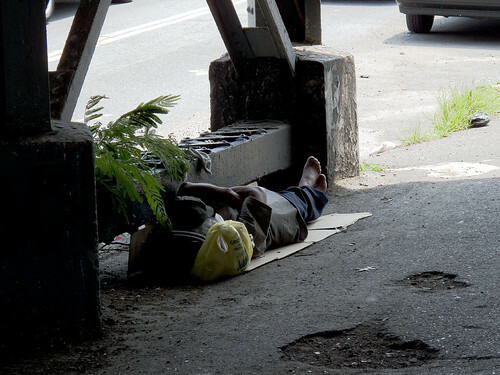 The term “homelessness” has stuck on as a polite society catch all, and describes a varied crowd of people whose problems run the gamut of human experience, not a homogenous population with a one size fits all solution. This was also before hyphenated american naming conventions became standardized in 1988). Such gentle and obtuse manipulations of the political landscape is not applicable to conditions found upon the mean streets of New York City, however, and sadly- in the end it will most likely fall to the tender mercies of the NYPD to decide the fate of these “Caballeros”. Just like it always does, in the end. The particular troll (anyone who lives under a bridge can be described as a troll, even those who live in the tony condos of DUMBO) is an aberrant creature whose skin has been rendered to leather from exposure to the sun. I was glad to see him asleep, and gingerly walked past him, as sleeping dogs should be allowed to lie. In other crossings of this angle between neighborhoods, he has been aggressive with me and demanded I pay a toll to cross. A natural victim and physical coward, what choice could I make, and I gave the mocking troll his due- a handful of my hard earned coinage. I don’t condemn his type, just him. He is a jerk. When you have passed the two rail bridges, you will see 39th avenue, which offers a titanic vista of Manhattan (this is actually a block or two away from 43rd street, looking west, just for the record). You have also just entered the lovely neighborhood called Sunnyside Gardens. Sunnyside Gardens is a predominantly residential area encompassing part of 16 blocks following the city’s traditional grid street pattern within the larger Sunnyside neighborhood of Queens. Located between 43rd and 52nd streets, Queens Boulevard and Barnett Avenue, Sunnyside Gardens was developed between 1924 and 1928 by the City Housing Corporation and designed by architects Clarence Stein, Henry Wright, and Frederick Ackerman and landscape architect Marjorie Cautley based upon the English Garden City model. 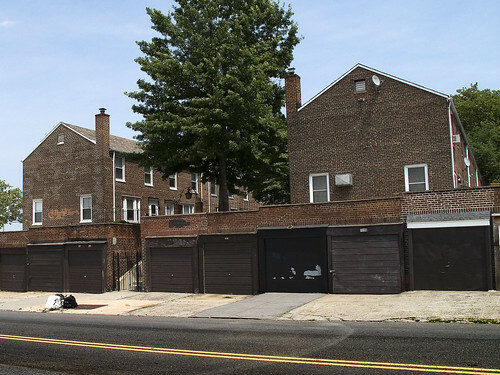 The neighborhood is comprised of roughly 600 two-story row houses in combinations of one-, two, and three-family units grouped in clusters of 10 to 12 around a series of courts containing common gardens, in addition to eighteen apartment buildings, two community parks and neighborhood stores. The common gardens account for over 70 percent of the lot area and are a primary defining feature of the site plan, offering residents light, air and greenery. (e) to guide future development within the Special Districts that is consistent with the existing character, quality and amenity of the Special District. and of course- Forgotten-NY has been through here as well. I’ll be returning to Sunnyside Gardens in later posts, but today, we’re heading for the comforts of the grave. 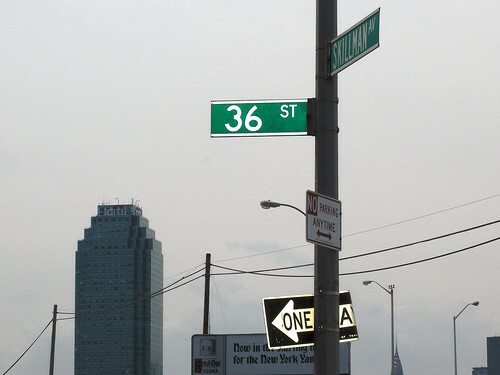 At the corner of Skillman Avenue, turn right. 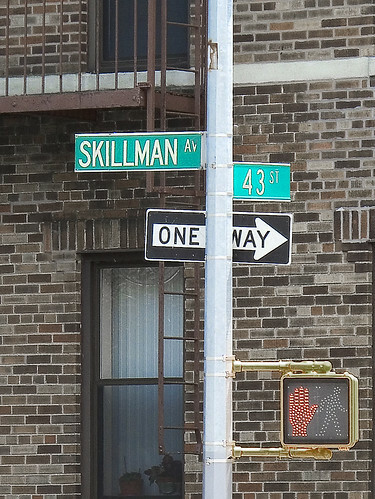 Skillman avenue can be a dangerous place, traffic wise, so do be careful as you move along it. 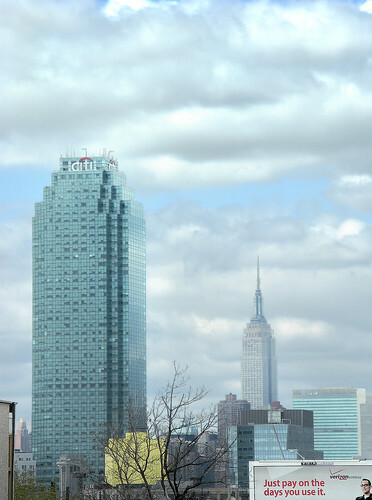 The Sunnyside community is located in the Borough of Queens, just a few minutes from the Queensboro Bridge and the Queens Midtown Tunnel. We are one of the most trafficked areas in the city. More cars pass through our commercial district of Queens Boulevard (Sunnyside’s restaurant row) each day than most neighborhoods see in a normal week. 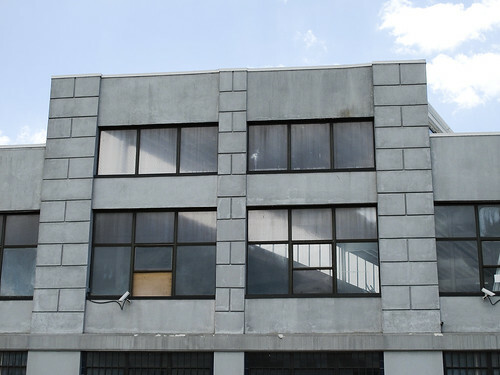 Located between the long-established communities of the Blissville area of Long Island City and Woodside, our unique location makes us easily accessible to Manhattan and only 15 minutes by train to Times Square or the Empire State Building. People in our area can often reach the theatre district faster then those living in some parts of Manhattan. Sunnyside is convenient, centrally located, and a great place to live, as long-time residents are quick to tell you. It’s believed Sunnyside got its name back in 1850 when the railroad built a station across from the Sunnyside Roadhouse Hotel. 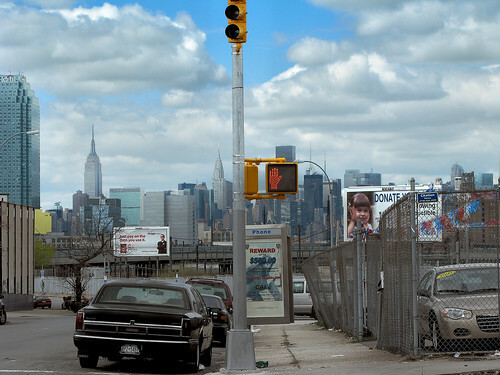 “Sunnyside is a neighborhood in northwestern Queens, lying within Long Island City and bounded to the north by the Sunnyside Yards, to the east by Calvary Cemetery and 51st Street, to the south by the Long Island Expressway, and to the west by Van Dam Street . The area is named for a roadhouse built on Jackson Avenue to accommodate visitors to the Fashion Race Course in Corona during the 1850s and 1860s. A small hamlet was built between Northern and Queens boulevards and became known as Sunnyside. Most of the land was low-lying and therefore cheap; from 1902 to 1905 the Pennsylvania Railroad gradually bought up all the land south of Northern Boulevard between 21st and 43rd Streets. The entire area was leveled and the swamps filled in by 1908 and the yards opened in 1910. The Queensboro Bridge opened in 1909 and from it was built Queens Boulevard , which ran to the center of the borough through Sunnyside, where streets were built along the boulevard. Sunnyside Gardens (1924-29), a complex of attached houses of two and a half stories, with front and rear gardens and a landscaped central court, was on e of the nation’s first planned communities, hailed for its innovative design by such scholars of urban life as Lewis Mumford (a onetime resident). During the following years the neighborhood became middle class, and largely Irish. During the 1940s and 1950s its large apartments enticed many artists and writers and their families to leave their cramped quarters in lower Manhattan , and the area became known as the “maternity ward of Greenwich Village .” Sunnyside during the 1980s attracted immigrants from Korea , Colombia , Romania , and China , though on the whole fewer immigrants than some of the surrounding neighborhoods in northeastern Queens . 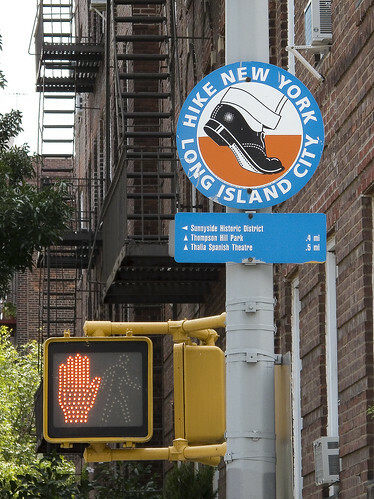 The Public Art Fund and artist Richard Deon placed 44 of these signs around Long Island City in the early 90’s to encourage people to walk around the area and take in the wonders of the place. Hey, that’s what I do, and yes, when I started these pestilential exercises which became explorations- I did use these signs as markers and waypoints. Success, Mr. Deon. As I wandered off the path set out by these esthetes, I began to realize that none of these signs point at the Newtown Creek- only at Manhattan and its cultural tendrils. 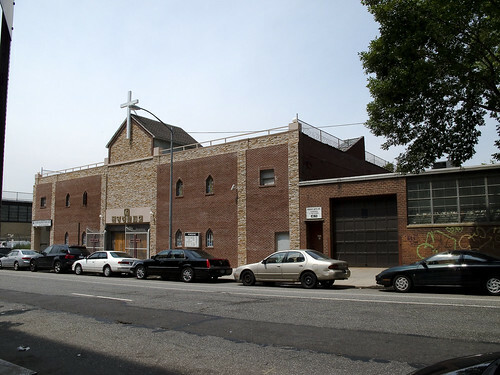 Moak Yang Presbyterian is a small church on Skillman Avenue, which was recently renovated after an emergency closure by the Dept. of Buildings siting a sagging brick wall. Moak Yang translates as “Good Shepherd” I am told, and the Pastor is the Reverend Byung Ki Song. I don’t speak Korean, yet another failing of my weak intellect, but here is their website. I entered the same URL into google translate and saw evidence of a wholesome and prospering church whose agenda and programs would be familiar to any 19th century New England Yankee- even one from Providence. Until recently, a sign proclaimed this lot alongside the church as being General Motors property, and it lay fallow for all the time I’ve known it. 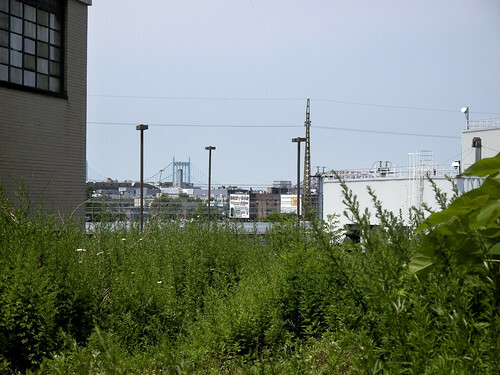 The tangle of weedy growth and rat middens that were the site’s only residents have been supplanted by a parking lot for delivery vans. If you catch the day just right, you can actually see all the way to the East River- looking over the shallow and marshy hills of Astoria from here, with both Triborough and Hells Gate Bridges in the distance. 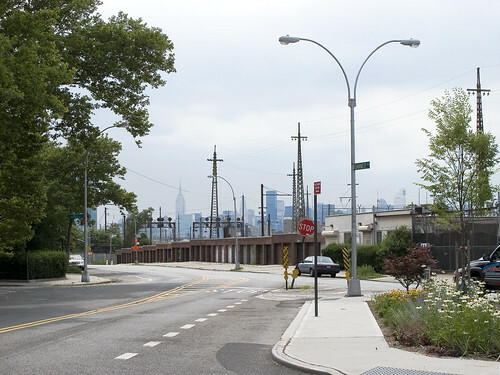 The “big show” that is Long Island City officially begins at 49th street, when the pretense of being a neighborhood ends- and the unforgettable panorama of the East River Metroplex becomes visible. A sound will escape your lips, something like “whoof” or a “wo”, assuming you make it here before noon when the sun will be at your back and the Manhattan Skyline glitters like an enormous jewel. 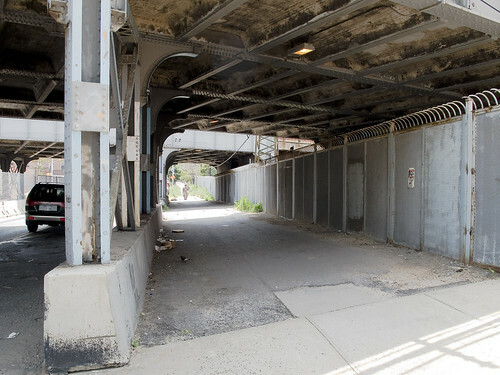 39th street is Steinway street on the other side of Northern Blvd, and what you are standing on is no sidewalk- but a bridge over the titan Sunnyside Yard. 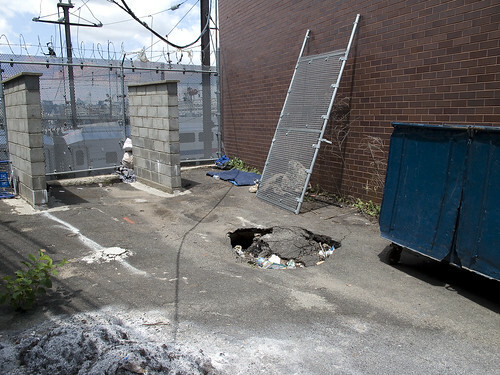 Remember- almost everywhere in the center of New York City, the ground is actually the roof of another structure- sewer, subway, or cellar- or series of structures. When built by the Pennsylvania Railroad (PRR) at the beginning of the 20th century, Sunnyside was the largest coach yard in the world. The yard served as the main train storage and service point for PRR trains serving New York City. It is connected to Pennsylvania Station in Midtown Manhattan by the East River Tunnels. Currently, the yard is owned by Amtrak, but it is also used by New Jersey Transit. 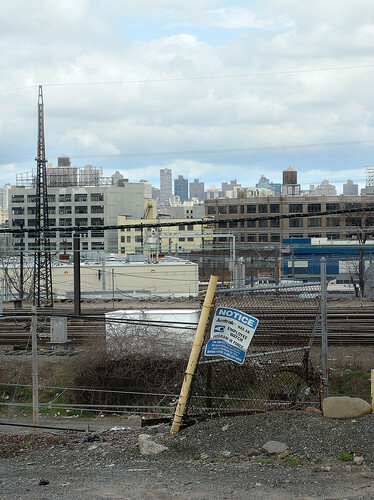 The shared tracks of the Long Island Rail Road (LIRR) Main Line and Amtrak’s Northeast Corridor pass along the southern edge of the yard. 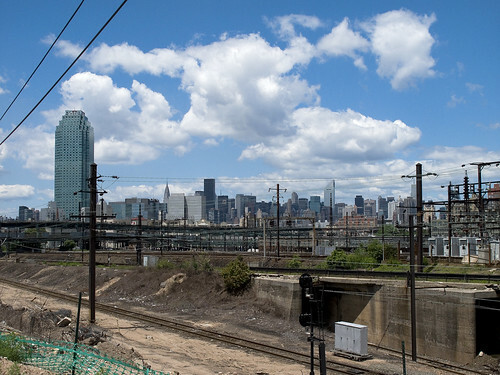 Plans for the LIRR East Side Access project to build tracks to Grand Central Terminal would have those tracks diverging in the vicinity of, or perhaps through, the Sunnyside Yard. Northeast of the yard there is a balloon track which is used for “U-turning” Amtrak and NJ Transit trains which terminate at Penn Station. Leading eastward, this balloon track switches off at the southernmost portion of the yard. It then turns left under the LIRR/Amtrak tracks, turns left once again, and merges with the Sunnyside yard track to turn the train west toward Penn Station. For such an important facility, the security at the Sunnyside yard is abyssmal. This, for instance, is the security fence on Skillman. Graffiti observed along the tracks and the numerous reports of urban explorers speak to the time and opportunity afforded trespassers- who ignore the dangers of crossing active tracks, electrified rails, and all sense of personal safety. Let’s be clear- without special training and equipment- you can easily get killed down there. I also think its the greatest unused location for a motion picture I’ve ever seen. Anywhere you point a camera on Skillman Avenue, you will find a great shot. The only hassles I’ve ever had here (a deserted street on the weekends, especially holidays) were from union guys asking me what I was doing, which wasn’t really a hassle. They were pretty cool, they were just checking I wasn’t “an environmentalist” trying to jam them up. Amtrak security rolls by, but never stops to ask questions. Cops breeze by and don’t even slow down as they pass your humble narrator while he is using a tripod. 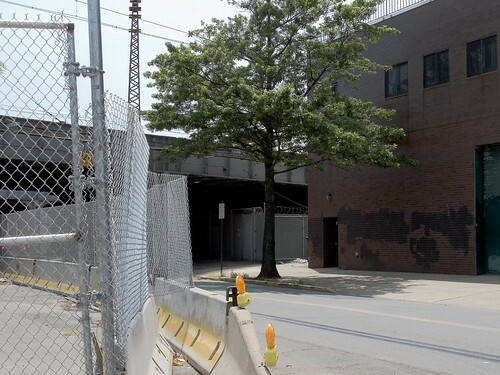 Here’s what one of the MTA’s architects proposes for the far end of the Yard. Not that long ago, this was the most important place in Queens, and the gateway for freight into Manhattan from all points east. 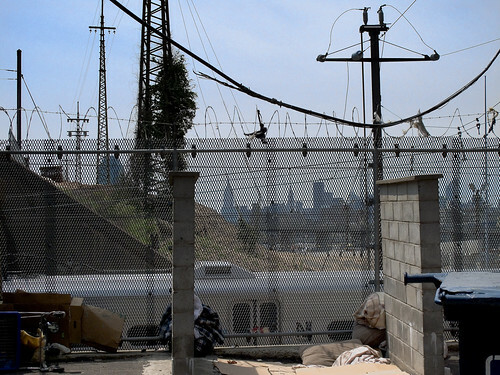 It is still a critical part of the transportation infrastructure of New York City, but the empty factories- and worse- the subdivided ones speak to the economic might which was won, and has since been lost around the Sunnyside Yards. Astoria and Sunnyside provided a large number of the 16,000 employees who worked here at the Degnon Terminal, almost all of whom belonged to labor unions. These were jobs “with benefits” like health insurance or paid vacations, a rarity before the late 1970’s. The shells of the titanic companies like Adams (Beeman) Chewing Gum, and Sunshine Biscuits line the streets surrounding the yard, but modernity has largely cut their links to it.